The gully/chimney immediately left of the afterglow buttress with 3 stepped roofs. Good chimneying, ice and turf, classic mixed climbing. 2 pitches up chimney. 3rd pitch: 'angled back left up cracks on a steep headwall, heading behind a larger fin of rock, which appeared from below like a V groove, but gave more pleasant chimneying. The crux was below this up a hand crack, so good gear and good hand jams. FA Steve Fortune, Peter Harris, Ari Kingan, 2013. 25m to belay ledge or continue up left hand cracks to the top and Double Bolt Belay. Start up a left facing corner. Can be climbed with or without the bolts as there is plenty of good traditional gear. 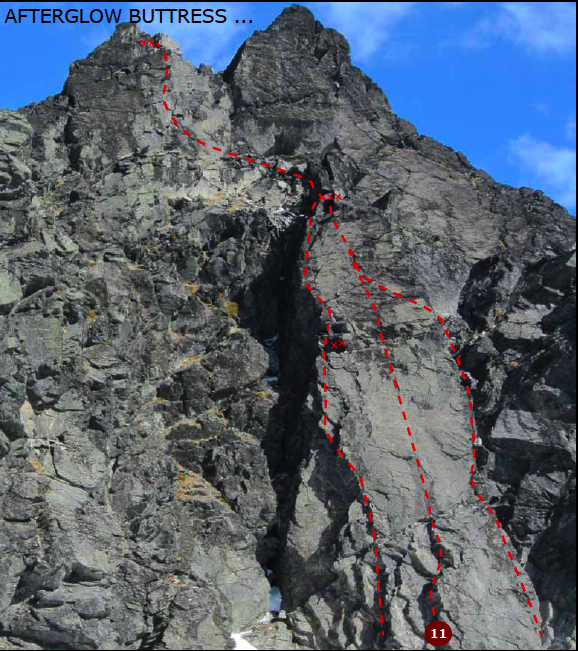 The first ascensionists have asked for the bolts to remain, however if you want one of the best grade 17 traditional routes in the country climb the route as a single 45m pitch on gear. Take twin ropes, a selection of small wires, small Camalots and doubles of regular Camalots to #4. Dave Bolger, Reece Doyle 2010. Start up right hand arête before tending slightly left as you get higher on the face. Very run out in the lower three quarters and could use a clean. If you don’t feel comfortable at the grade, this is a good one to avoid. There is a rap station at the top to take you back to the anchors of Afterglow. Daniel Joll, Cris Vanyo 2011. Thin seam and crack just around the arête of Ground Rush. head straight up short pitch. 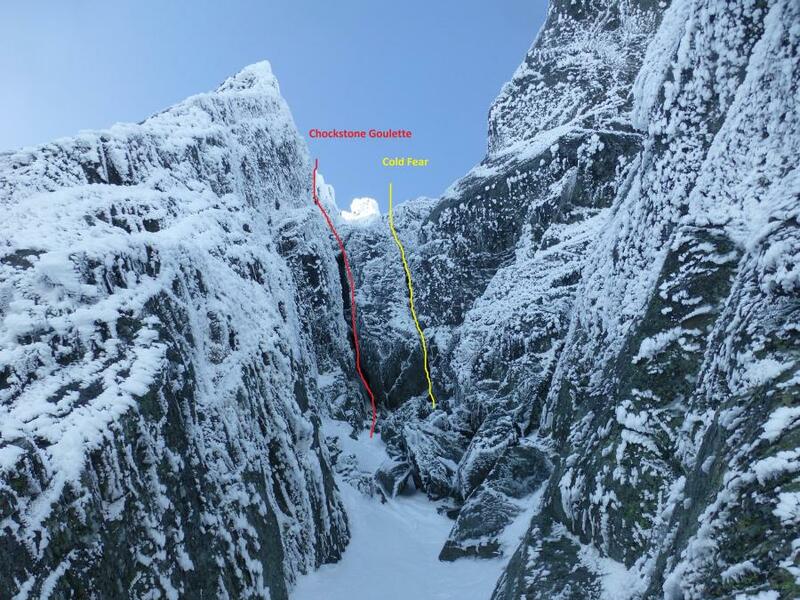 Danny Murphy, Alex Corpas 2011.
follow a vauge crack just right of the left arete to the top of the buttress. Just enough gear to keep you moving. For an easy exit escape right into the gully. Follow the steep crack (right most crack in the clear recess just after the afterglow buttress.) Good protection and a couple of hard moves lead up to a belay stance. Second pitch M4ish final pitch M4-5 the route gets its name after Jaz took a small fall on the final pitch landing back onto the ledge (which was covered in deep snow) so no damage done. After the fall he sent the pitch. The pic is of Jaz on the final pitch.